Movers of San Antonio - Home of the $65 Special! HOME OF THE $65 PER HOUR MOVING SPECIAL!!! Movers of San Antonio is the Home of the $65 an Hour Moving Special!!! We are one of the highest rated San Antonio movers. 38% of our business comes from repeat customers! Movers of San Antonio only hires professional movers dedicated to providing the best customer service. Our estimates are accurate and detail all of your costs. We move your homes in timely manner while you sit back and enjoy with your family & friends. We transport your goods to different areas of the city safe and sound no matter they are short or long. Thank you, we have recieved your message. We will get back to you shortly! We have the lowest prices and best service of any licensed mover in San Antonio. Our hourly rates are less than half the price of some of our competitors, so we save many of our customers $100's of dollars on a single move. How do we do it? We make more moves than any other moving company in San Antonio. Moving services and support 7 days a week! Moving boxes and expert packing services available! Experienced, efficient moving crews and state of the art trucks. Why use Movers of San Antonio? We are the Home of the $65 per Hour Moving Special so the bigger your move, the more money you will save by using Movers of San Antonio. Our movers are fast, courteous, and professional. Our trucks are dependable and designed to haul heavy loads safely. We take care of your furniture by blanketing and shrink wrapping each item to ensure that no damage is done to your belongings or to your home. Moving furniture quickly is not just our job, its our passion. When you move with us all of your belonging are covered for any damages and we are licensed by the State of Texas. Movers of San Antonio has all the right equipment and tools to make your moving experience stress free. By going to a mover that is licensed and insured for your move, you will get friendly movers that can quickly move your belongings, and our moving pros are always happy to answer any questions you may have. We specialize in both house and apartment moves and we will complete your move faster and with a better price than any other mover in San Antonio. Honesty. Here at Movers of San Antonio we have great prices and service with no gimmicks. Our reservation agents are not commission salesman and are trained to never over promise or mislead just to schedule a move. We stay busy because we don't give bogus estimates or misleading prices we when reserving your move. We take the time to explain the moving process and disclose everything upfront so that you can feel confident and have a proper expectation of what type of moving services we will be providing. Our prices are great but if you are looking for a cheap company please look elsewhere because we are not what you’re looking for. Our mission to move your family's belongings quickly, but without causing any damages. Our employees are our partners and most of them have been with us for years so they know how to properly and safely completely your move. They will not run with furniture or cut corners just to get a tip. We understand that everyone has a budget so our movers will do as much or as little as you want. The can do everything for you from start to finish or just the move the heavy stuff so that you can maintain your budget. If you would estimate of how long your move will take please click HERE. We have honesty, integrity, expertise, and would find it disgraceful to lie to a valuable customer. We have no intention of overselling or sugarcoating the unfiltered truth just to get more business. This is why we’re voted the #1 most dependable moving company in San Antonio. Our movers will come to your residence and with 26 foot long moving truck that is completely stocked with shrink wrap, moving blankets, and dollies. We will start by taking a quick walk through your residence so that you can show us which items will be moving and which ones will be staying. 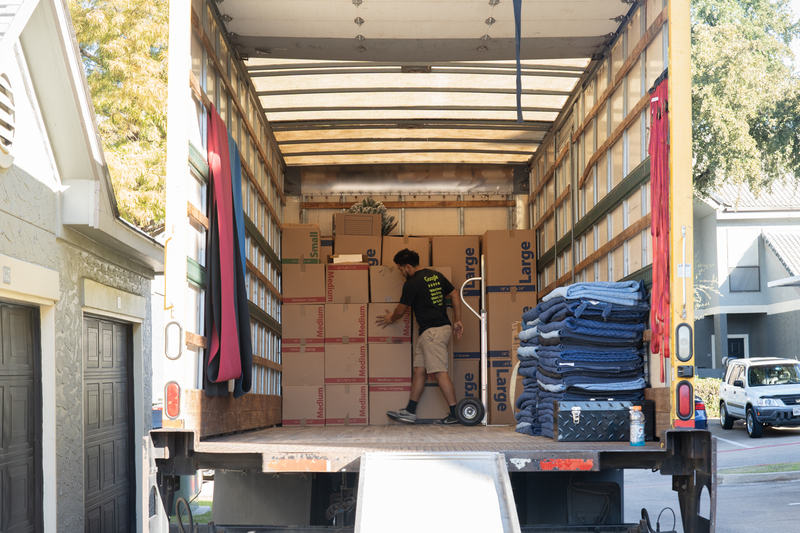 If needed we will then assist you with packing and we will then use moving blankets and shrink wrap to pad your larger items so that they can be loaded onto the truck. The movers will stack and strap down your all belongings to prevent items from shifting or being damaged during transit. When we get to your new residence the movers will place move your belongings to the room of your choice and then set up beds and connect washer and dryer connections. Even though we are a full service moving company, we understand that everyone has a budget so our movers will do as much or as little as you want them to. We understand that every move and every customer is different so we will do our best to keep the lines of communication open so that your move will go fast and smooth. You will have peace of mind, knowing that you are hiring the largest moving company in San Antonio that performs thousands of moves each year and we would be happy to answer any additional questions you may have regarding your upcoming move. Call 210-348-8199 for a fast and friendly moving estimate today.